I remember when I was in fifth grade and my favorite teacher handed us a beautifully bound scrapbook of our memories from the year. As I looked through mine, I realized it was a keepsake of the pages I'd written the entire year. We didn't know that our teacher was saving the pages we wrote throughout the year about our memorable events, field trips, holidays, and what we were learning in class. Last year I decided to introduce something similar to my class. 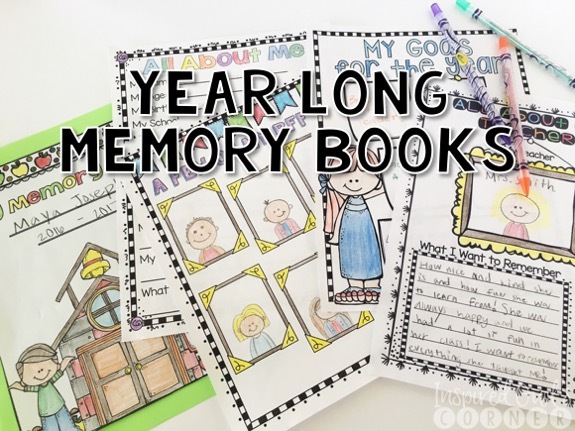 My students created memory books that they also worked on the entire year. They documented experiences such as their first day of school, highlights of each month, our Fall Festival, their birthdays, and our field trips. I began to see students who were struggling with writing become successful and actually enjoying it. As my students finished each page, I collected and organized them inside of a plastic file crate similar to the one below. At the end of the year, it was easy for my parent volunteers to make sure each book was in the proper order so I could quickly bind them with my school's binding machine and pass them out on the second to the last day. The students who didn't purchase a school yearbook last year were able to have their friends sign their memory books on the autograph pages. My students and their parents loved the finished products! ere too overpowering and didn't look as nice as the colored pencils or crayons. I really like this wonderful scrapbook idea. I also loved reading your experience that you had with these scrapbooks in your childhood. I have just started teaching at Phoenix kindergarten so such ideas are going to be extremely helpful for me.